I’m a Lyrical Gangsta – MEMOIRISH. But that’s not much of a surprise. A Filipino saying she loves karaoke is like a white dude saying he loves, uh, never mind. Let’s just say it’s pretty common. It’s so common the fam and I would gather ‘round for karaoke during the holidays while I still had most of my baby teeth. We sang so much that when we immigrated to the US to join our mom in the Bronx (It’s a long story, but long story short, my mom was an overseas worker), she introduced us to her friends through song. Seriously. At parties, my sister and I wore our Swan Lake tutus and pranced around while my mom sang “From A Distance.” We sang something Smokey Mountain. My brother did a rendition of this. It was so very von Trapp, but with coconuts. Yes, there are videos. No, you can’t see them. Soon enough, puberty hit. And soon enough, we got too big for our tutus and too cool to hang with mom and her friends. We preferred the Fugees. Sitting on stoops. Abusing our unlimited internet time on AOL. In short, we became assholes. Baggy pants-, oversized flannel-shirt wearing assholes. The family time stopped, and so did the singing. At least in public. Inside, oh how the fire burned. To my tape recorder, I sang Jewel. The shower was my concert. For years my illustrious music career languished. I was a writer, I decided. A serious writer with no time for such frivolous pursuits. And then came the jingle. In grad school, though the term grad school is dubious for the kind of stuff we actually do, we had to write a jingle. And not just write it, we had to perform it. We could use no accompaniments, no instruments. No clapping was allowed. I hadn’t sung alone in front of a crowd, at least the kind of singing that didn’t come with alcohol and a numerical score at the end, since I was, like, 12. I refused to volunteer. I watched my classmates go one by one execution style until it was my turn. I walked to the front, barely looked up, and sang. I like coffee, lots of coffee. I like coffee on the train and in a cup. It was bad. My voice was shaky. I messed up a crucial part. I should have blacked out. But you know what? I lived to tell you about it. I decided if I could badly sing my jingle to a roomful of my peers, I could badly sing anything to anybody. But not just sing — oh no, Karen is never satisfied with the sensical. Once summer started, I vowed to sing while playing a musical instrument. Not that I knew how, but I figured I’d learn. And why not? If my stellar Rock Band and Guitar Hero career of consistently racking up 100% on the guitar on medium was any indication, surely the ukulele couldn’t be too different. That turned out to be false, but a certain level of naivete is sometimes necessary. 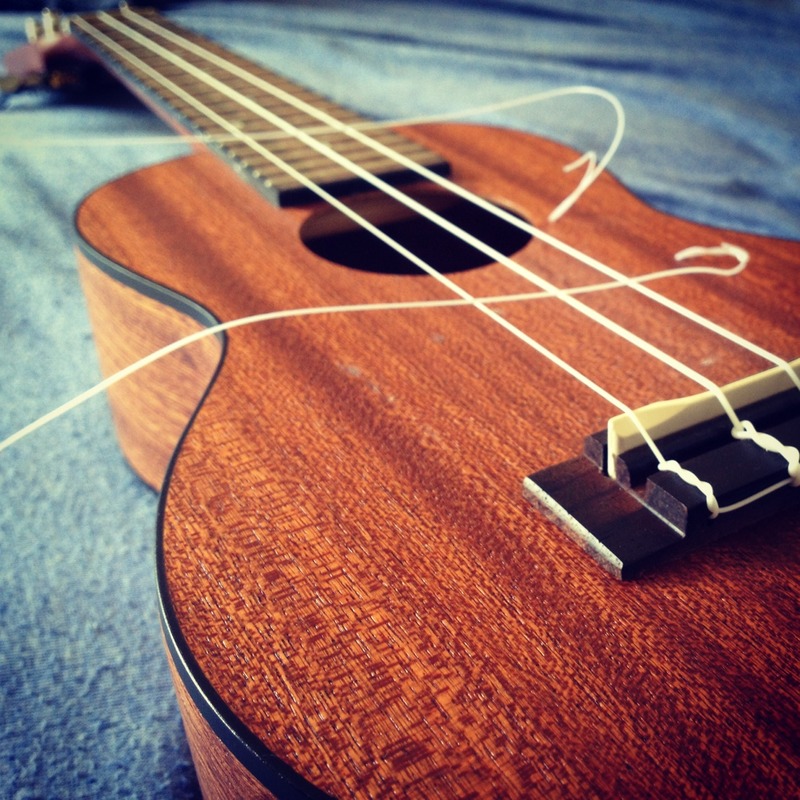 Since getting the uke for my birthday, I’ve learned one song a week. I have callouses, and I like it. I like it a lot. Unlike writing, it doesn’t have to be perfect. The joy is in learning a new song. The Asian tiger mom in me often makes me play things over and over again, but the later, more polished ones tend to be more joyless than the flawed early versions. Which is why I chose to show you this one. This was about the fifth time I ever played it. I messed up the lyrics. I messed up some notes. I made up some strums.